As previously investigated here, bygone times are full of hilarity -- if one didn't have to live through them. For instance, we've previously spotlighted Habitina, a concoction sold to help drug fiends kick the habit by ingesting a blend of morphine, heroin, and alcohol. I fear it didn't work as advertised. 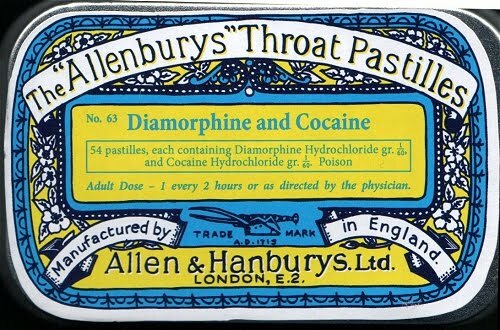 There is little doubt, however, that The Allenbury's Throat Pastilles (tin pictured above), did indeed provide relief for sore or scratchy throats. The blend of diamorphine (another name for heroin) and cocaine would certainly combat throat discomfort. Because the stout porter bitter. Lee Jackson has been kind enough to set up the Random Victorian Joke Page. It's worth a page refresh or two.